You, my dear readers, get to be part of something very special. 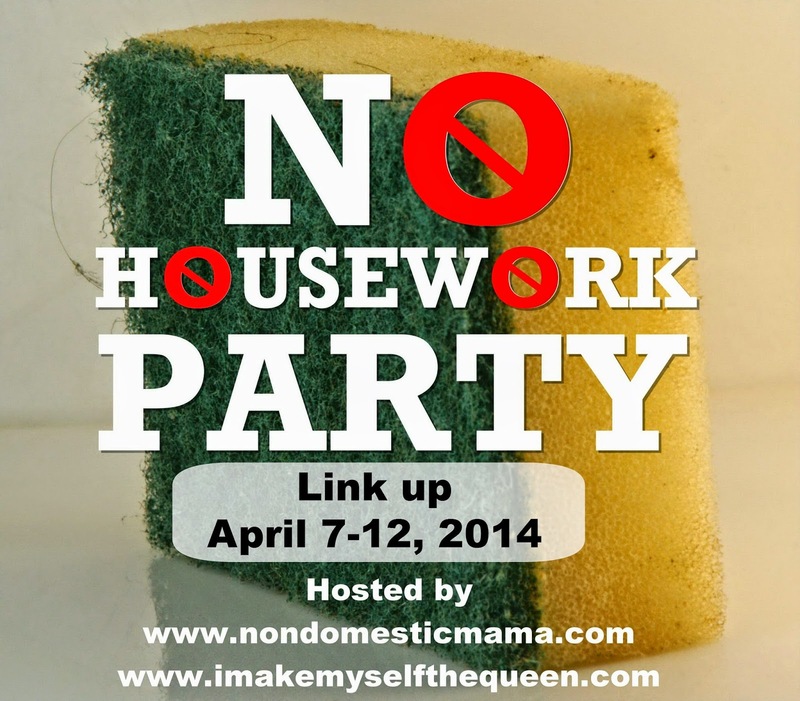 In celebration of this most glorious day of all days on the calendar, Jenn from Coolest Family on the Block & I Make Myself the Queen and Rachael from Non-Domestic Mama are teaming up to host the fourth annual No Housework Party! Oh yes. Not much will be different for Jenn and I since we avoid housework every chance we get…but for those of you dedicated domestic goddesses…we’re giving you the day off! From Monday, April 7 until Saturday, April 12, 2014, stop by and link up your post. Do you hate housework, are you no good at it, or are there simply just not enough hours in the day to do it all? You’re not alone. All over the country non-domestics just like you are sweeping the cobwebs aside (figuratively…we don’t sweep for real, silly! ), stepping out into the world and declaring, “I hate housework!”. We’re walking right past our piles of organized chaos and confessing to the world, "I am Non-Domestic" and “I have better things to do than dishes.” Join us on April 7th to link up any of your domestically challenged blog posts. Show us what you do instead of housework, how you plan on celebrating No Housework Day, or tell us about that time you tried to clean something and it backfired on you. If you’re reading this while wiping your computer screen with a special cloth…you probably need to declare a holiday more than any of us (put the cloth down and back away, you weirdo!). Can’t take off a day of cleaning? You might feel like you don’t belong here, but you couldn't be more wrong, my friend! You are welcome to link up any of your housework posts…make us feel guilty and show us your tips, tricks, and lovely organized closets. We’ll call you a show off and give you a ;) winky to your face and then we’ll probably talk about you behind your back…but seriously, you’re totally welcome to link up! Start planning how you’re going to celebrate No Housework Day (or if you’re anything like us...procrastinate and try to come up with something at the last minute ;) ) and then meet back here at Non-Domestic Mama or at I Make Myself the Queen April 7th-12th to party!